سواءً كنت مسافراً بغرض السياحة أو العمل، ذا مورينجز أون كافيل هو خيار عظيم للإقامة خلال زيارتك للمدينة. يسهل الوصول إلى هذا الفندق ذو 4 نجوم من المطار، فهو يبعد عنه مسافة 15Km فقط. سوف يعشق النزلاء موقع هذا الفندق، فهو قريب من أهم المعالم السياحية في المدينة . يعمل ذا مورينجز أون كافيل على ضمان إقامة مريحة لضيوفه من خلال خدماته الممتازة وحسن ضيافته. يمكن الاستمتاع بمجموعة من الخدمات على أعلى المستويات في الفندق كمثل أمن على مدار 24 ساعة, توصيل من البقالية, خدمة غسيل ذاتية, تأجير واي فاي محمول, خدمات بريدية. تعكس غرف الفندق البالغ عددها 72 المنتشرة في 14 طوابق جواً من الدفء والألفة.خدمات عصرية مثل تلفزيون بشاشة مسطحة, مرآة, صوفا, غرفة معيشة منفصلة, غرف لغير المدخنين موجودة في بعض الغرف المختارة. صممت خدمات الاستجمام في الفندق والتي تتضمن قوارب, حوض استحمام ساخن, ساونا, حمام سباحة خارجي, سبا لمساعدتك على الاسترخاء والراحة. مهما كانت دواعي سفرك فإن ذا مورينجز أون كافيل هو خيار ممتاز لإقامتك في المدينة. A very good apartment. can't ask for more. I stayed for 3 nights and nothing I could regret about it. Location was good, about 7 minutes walk to the tram, 10 minutes to the beach. The apartment is spacious, beautiful view from our balcony (especially during the sunset). The apartment is very strategic in location. It is very close to a lot of restaurants and malls. A very big supermarket is just opposite it. We have chosen 2 Bedroom Deluxe. Although it costs more but what we get is extremely good. Very modern and nice apartment. Even with a jacuzzi in one of the bathroom. The only con is no shampoo is provided. We have to buy it ourselves. Only soap bar is given. Please take note that some other necessities such as toilet roll, laundry powder and dish washer liquid provided are just enough for 1 - 2 nights stay. You may ask for another one or two sachets from the counter. But if you are staying for more days, you have to replenish those things yourself from a convenience store or supermarket. Very good. 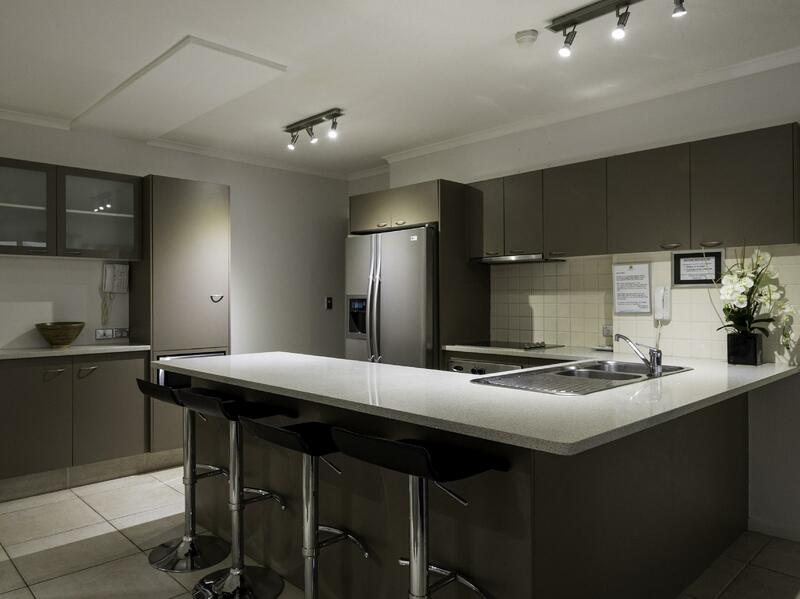 Located in a good location near cbd and surfers paradise. Food is easy to find. Attractions are near. Less than 15 minutes bus to Movie World and Sea World. Would definitely stay here again. We booked the 2 bed apartment for 4 nights. we got a high floor and river view rooms. The views were stunning. And the hotel is a a 10 minute walk to surfer paradise so the location was extremely ideal. The rooms and baths were clean. Comes with all the usual amenities of an apartment. Free car park at basement. No free wifi even at lobby. We would definitely stay here again as a group. Friendly & Helpful Staff , Nice and Great Apartment w Great view , PERFECT location ! 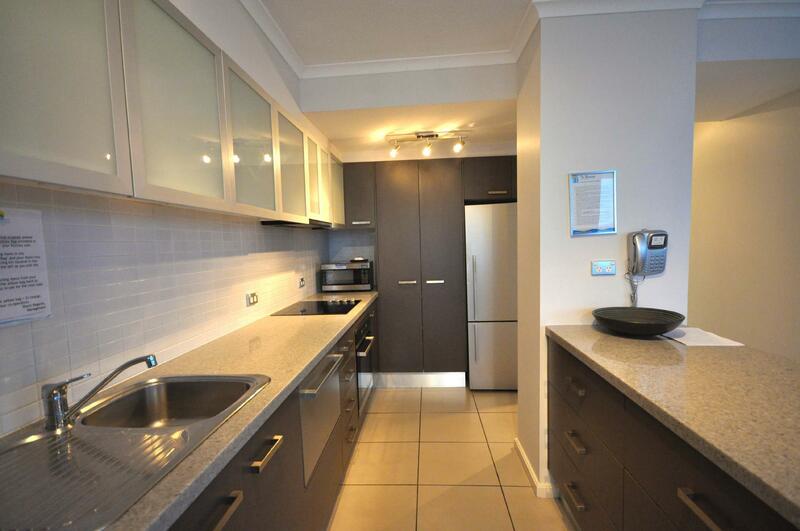 The location is fantastic, very centralised in Surfers Paradise. The apartment is spacious, perfect for a family of four apart from cleaning which could be better. It was a bit smelly in the master ensuite bathroom and the air conditioner was not working in the master bedroom and there was no air con in the second bedroom. Even though there are ceiling fans in both bedrooms, air conditioner in each bedroom would be much better in the hot summer. Very dirty apartment. Drawers were filthy , full of dust and rubbish from previous guests. Bedside tables had a thick layer of dust. Bathroom door was covered with sticky stains and human hair stuck to it. I was disgusted to touch anything. Laundry and kitchen supplies were not provided. We were given 1 tiny piece of soap and one tiny shampoo (for 3 people). Iron was rusty, I ruined my shirt with it. Had to go to supermarket to buy wipes and sanitising spray to clean surfaces, door handles and drawers. Such wonderful place and people. Carol and her staff are very helpful and friendly. Made us feel right at home for our first trip ever to Australia. Location is perfect. We really enjoyed the proximity to city conveniences and beach while theme parks and attractions are just a click away. And the shuttle come right up to your door steps to pick you up. All in all, my wife and kids really enjoyed our time there. 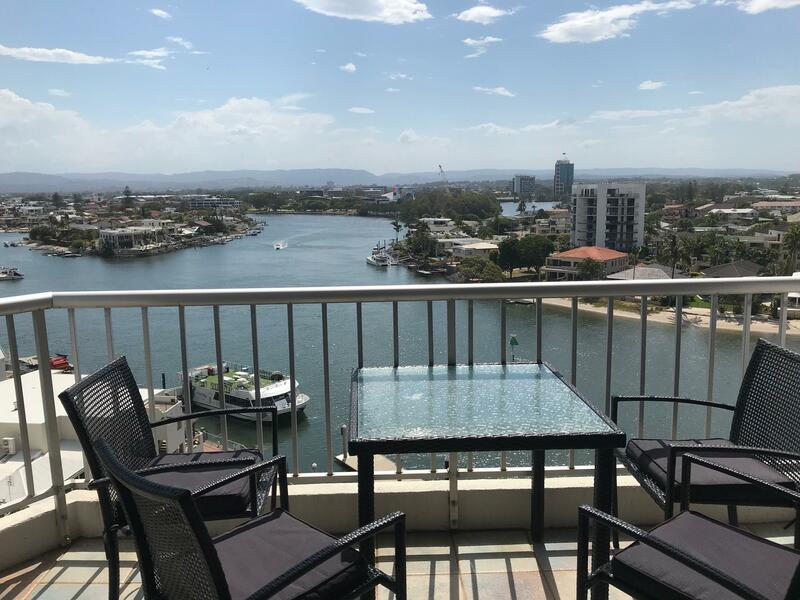 Moorings on Cavill is in a fabulous location. It is right by the water, not too close to the main avenue that you get all the noise if you're there on the weekend yet close enough that you can get to the heart of the main strip after about a 5 min walk. There was no housekeeping during my stay (4 nights) and you are expected to empty your own rubbish at the end of your stay - which I guess is expected if you're in an apartment. They do have a pool if you wish to relax during the day otherwise the beach is only a 7 min walk away. This hotel is just a minute to suffer paradise. The only problem is if we stay for 1 week, they never clean up our room. So anything about towel, soap, tissue, and anything about free item as usual in the hotel we only get for first time stay. Staff is very kindness. This is a small block of apartment, so do not expect anything fanciful. The furniture inside the unit is not very new, so I did not quite like it when I first entered the unit. However, I grew to like it because of its proximity to everywhere. It is just a distance throw to the boarding point of the Wyndham Cruise, just across the road you will find 3 supermarkets (2 Woolworths and 1 Coles). Paradise Centre (where you find the biggest Timezone and late night eating spots) are just a 10 minutes walk away. And YES, Surfers' Paradise is just across the road from Paradise Centre as well! So all you need to do is drive out to your playspot in the day, and come evening, just park the car back to the apartment, cross the road and you get all the things that you need. Convenient! Stay at this self service apartment was good. Reception were friendly enough and helpful. I was asked that my credit card need to be swipe for a small amount for deposit and that a refund be credited on departure. Checked out of the hotel and was horrified to find that a fair amount was charged to my credit card the following day. Called the hotel and was told this was an error and that the amount should be charge to Agoda and will be refunded to me. Credit card slip for refund of the amount email to me, but 3 days later it still have not appeared in my credit card account. Will be chasing them again. VERY DISAPPOINTED. It was a great stay with our 3 and 5 year olds. We cooked, did some laundry, watched Foxtel and walked to the local shops to eat, shop and for our attractions. The supermarket was across the road and was very handy. The staff were very friendly and helpful with booking all our attraction and shuttle bus transfers. Excellent, Phoenix met us when we arrived (a few hours early) and bent over backwards to get us in early as my daughter was not well. The rooms were comfortable and clean and contained everything we needed for our week long stay. Very close to everything, shops, food, attractions, and staff willing to advise you on where to buy what (ie we needed a birthday cake :-) ). Anything that needed attention was dealt with promptly and professionally with no disruption to ourselves. Very happy, will be back if visiting the Gold Coast again. Only downside, Parking is a little 'tight and difficult to manoevre'. It was good overall. Ask for apartment 29 as it looks quite new and the view was beautiful. The beds were very comfortable though the pillows were too soft.Do note that only the hall and master bedroom have aircon whilst the other room only has a ceiling fan.